NASA?sspace shuttle Discovery is on track for a planned Tuesday launch toward theInternational Space Station, mission managers said Saturday. 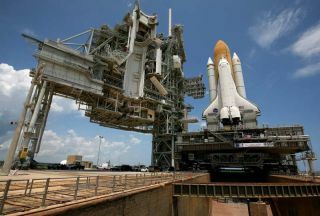 The shuttleand its seven-astronaut crew are nearly ready for theirpredawn launch Tuesday at 1:36 a.m. EDT (0536 GMT) from NASA?sKennedy Space Center in Florida, said NASA test director CharlieBlackwell-Thompson. ?All of ourvehicle systems are in good shape. Our countdown work is progressing well,?Blackwell-Thompson said today in a morning status briefing. ?Discovery and herlaunch team are ready to go.? NASA begancounting down toward the launch late Friday and expects good weather forDiscovery?s liftoff. Current forecasts predict a 70 percent chance of favorableconditions for blast off. The potential for nearbylightning during fueling and isolated thunderstorms around launch time arethe only concerns. ?Weathershould be pretty good, overall, for launch,? said Kathy Winters, NASA?s shuttleweather officer. The moon willset late Monday night, setting the stage for what promises to be a beautifullaunch, she added. ?The skiesare going to be completely dark at launch time,? Winters said. ?So that?s goingto make for a veryimpressive launch if the clouds all get out of here.? Commandedby veteran spaceflyer Rick Sturckow, Discovery?s six-man, one-woman crew is setto fly a 13-day mission to the International Space Station to deliver a cargopod packed with about 15,200 pounds (6,894 kg) of new science gear, supplies anda treadmill named after comedianStephen Colbert. Threespacewalks are planned for the mission. Discoveryis also ferrying NASA astronaut Nicole Stott to the space station, where shewill replace astronaut Tim Kopra as a member of the outpost?ssix-person crew. Kopra haslived aboard the station since mid-July and will return home on Discovery. Stottexpects to spend at least three months aboard the station and return homeduring a planned November shuttle mission. Blackwell-Thompsontold reporters that engineers have completed testing a new power controllerthat was installed aboard Discovery after an older one failed. An analysis ofthe failed component will be presented to NASA managers during a Sunday meetingas one of the last issues to be settled before launch. ?From awork perspective, that work is behind us,? Blackwell-Thompson said.